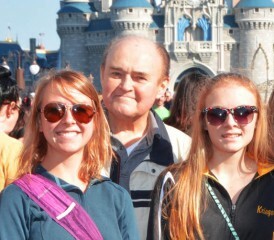 Frank S. celebrated his three-year survival mark by taking all six grandchildren and their parents to Walt Disney World last month, providing a weekend they would long remember. They rode Pirates of the Caribbean together. They all danced with Minnie Mouse. Dozens of group photos were taken. A family that once was engulfed by a horrific cancer cloud became a family bonded by wonderful memories being made. He had accomplished his goal. Frank, 73, was diagnosed with inoperable, malignant pleural mesothelioma in December 2012. But he has survived longer than expected by focusing on the family around him, staying too busy to feel sorry for himself. 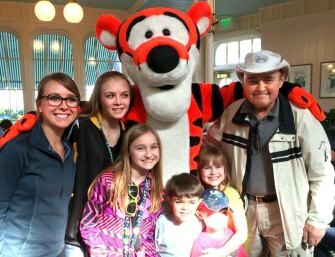 Mesothelioma cancer survivor Frank S. poses with Tigger and grandchildren at Walt Disney World. His youngest son had been diagnosed with stomach cancer in early 2012. His oldest son was diagnosed with bladder cancer a few months later. Frank’s diagnosis at the end of year seemed almost surreal. Fortunately, all three are doing well today. The younger son’s cancer has been halted with therapy that includes a continued chemotherapy regimen. The older son is cancer-free today after surgery. Frank, whose last name is withheld for privacy, still is getting chemotherapy and regularly going to the nearby medical facility for IV fluids that offset the rocky side effects of his medicine. None of the three are sitting home and feeling sorry for themselves. All are living active lives, working and providing inspiration to those around them. Cancer may have threatened to tear the family apart, but instead, it has drawn them closer together. The sons are 54 and 50 now. The trip to Walt Disney World was just one example. They lead separate lives, each with his own busy schedule, but everyone talks to each other almost daily now. Frank spent much of working life in the restaurant and food service industry, operating, managing and then owning multiple establishments. He partially retired in 2005, but he never slowed down. He remains an active partner in a management company that oversees a handful of restaurants and still sees each property regularly. The company has partnered with a local motel chain, and there is talk about the company building a senior center with assisted living nearby. He talks about retirement, but he doesn’t act that way. His days of swimming laps in the community pool are gone because mesothelioma has reduced his physical activity, but he stays active by doing things at his pace. He is proud of his still perfect attendance record, spanning 24 years, at the local Rotary Club. He talks to other cancer patients often during his trips to the clinic, sharing advice and offering tips, much like he did during his years in the restaurant business, always willing to share and help others.